Drawing inspiration from bifold doors, bifold windows are an innovative, stylish and functional window option for your home. The intuitive folding design provides a generous opening and access to the outdoors without compromising space, while the style promotes conversation and inclusiveness regardless of having a wall between people. The Bifold Window is perfect for entertaining, and when combined with bifold doors, results in creating the ultimate entertaining area. Often popularly located between the kitchen/dining and alfresco area, they provide a stage to communicate and serve from. Our Canterbury Timber Bifold Windows can even be supplied with an extended sill that can be used as a servery, allowing you to pass items, food and drinks through with minimal effort and maximum class. If you love to entertain, or simply love the style, the Bifold Window is the perfect choice for you. The Southern Star Group offers Bifold Windows in both Southern Star Aluminium and Canterbury Timber. Our timber bifold can also be treated with TimGuard for superior protection and an outstanding finish. A variety of powder coat colours, timber staining and timber paint allows full customisation to suit any home. 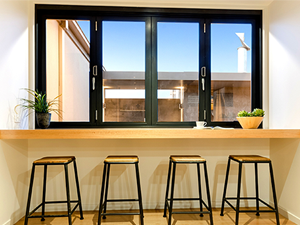 Versatility and functionality make bifold windows an ideal choice for numerous applications. For more information visit our website, showroom or talk to a representative today.